Animal husbandry of dry (pregnant) sows in the United States is in the midst of a transition from indoor individual gestation stall housing to indoor loose housing with group pens that enables greater sow socialization, space, movement and choice. Committed to this conversion, many U.S. sow producers are actively retrofitting existing barns and designing new enclosures for loose sow housing. To provide optimal animal welfare, loose sow housing success demands shared industry expertise and experiences, science and ongoing research, as well as the right combination of best practices, planning, products, people, and pigs. Sow producers are responding to social opinions, consumer preferences, animal welfare activists, major suppliers, grocers, restaurants, and legislative mandates to make sow welfare and quality of life their highest priority. Heightened consumer scrutiny on food production practices has led many food suppliers and retailers to focus their marketing efforts on differentiation (such as embracing non-GMO, local, sustainable, organic, antibiotic free and animal welfare-focused products) as a way to drive sales, customer loyalty, and increase margins by enhancing perceived value. In deference to this mounting pressure, suppliers are calling for the transition away from the use of gestation stalls (also called crates), and sow integrators, aggregators, and producers have been responding by transitioning their sow housing stalls to loose housing. 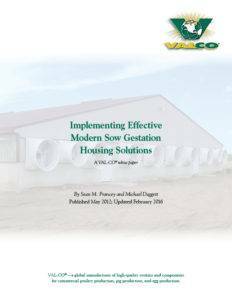 Swine industry research repeatedly reveals that there is no single best housing solution for gestating sows. Copious amounts of research indicate that skilled, dedicated stockperson knowledge and management in any modern design can yield healthy, high performing sows: A Texas Tech University review of 17 papers published from 2005 to 2012 that compared effects of housing systems on the welfare of gestating sows notes that all studies found similar productivity, physiology, health, and behavior among individually stalled or pen-grouped sows during gestation. While the National Pork Producers Council supports producer choice in the decision of sow housing, they oppose legislation that would mandate on-farm food-animal production practices, including banning the use of individual sow housing, because scientific research has shown that there is no one, single best way to house a pregnant sow.3 Tom Parsons, University of Pennsylvania, V.M.D., Ph.D., wrote, “Scientific evidence remains equivocal with regard to what is the best way to house gestating sows. However, both legislative initiatives and market forces will move sows out of gestation stalls over the next five to 10 years,” 4 at an estimated cost of $3.3 billion to sow producers. As such, the question as to whether gestation stalls are detrimental to sow welfare is no longer the debate. This paper will offer a broader view of the current debate, and detail housing practices to be considered when making the transition to loose group sow housing.